 At long last a dry and warm summer has brought firm and fast playing conditions to our links. Rainfall figures have been low for the past 3 months – April saw 31mm, May 21mm and June 13mm. Combine this with almost furnace like heat and the turf doesn’t take long to dry out. We have been watering the greens on a regular basis apart from the odd shower of rain that we’ve had. Today the heavens have opened and we have puddles everywhere apart from on the greens. That’s good news. The rain will soak in and help the grass recover along with giving some well needed moisture to the divot filling. The Scottish Boys U16 Championship went well with a couple of dull and damp days to start then a lovely sunny day to finish. We were nursing the greens along as it was so dry before the event and doing a bit of hand watering to areas under stress. When the rain came it greened up the greens and prompted more growth than I would have liked. We double cut and rolled the greens for the last 2 days and gave an extra roll before the final round producing a perfect speed and test for the boys to enjoy. We had a truly International field and the winning score of -9 par was excellent from Italian Matteo Cristoni. Our fairways had only been cut once in a month just before the boys U16s and this week just to go over any green bits. I prefer to keep a bit of grass on the fairways during drought weather as it really does help them sustain cover in difficult times. We are also saving on diesel! The wetting agent applied in spring also provided a little insurance. Thank you again to all the helpers giving up their time to help with the fairway patching. Irrigation system – the system has been put to the test this summer and has had it’s fair share of problems. The system was installed in 1981 and is now 37 years old! I was noticing some greens were looking more stressed than others and others particularly green looking and realised that some greens were sticking on and others not coming on at all. 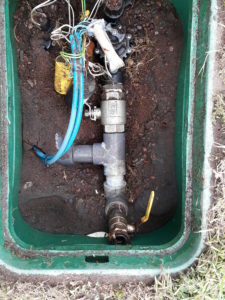 There have been a few issues with valves needing cleaned out or renewed, electric coils and decoders replaced and 3 burst pipes to contend with. The tees sprinklers on most tees are at most inefficient and wrongly placed and need re configuring for more efficient water use. This uncertainty has required the irrigation cycles to be watched at night to see that everything is getting water as it should because it seems like we are getting one problem after another. 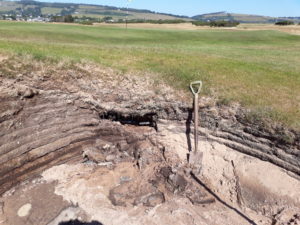 Just the other morning the 4th green stuck on and it got 50 minutes of water before it was noticed. Not easy to keep the greens consistent when this happens. The system is limping along with old components at breaking point and it is around 10-12 years overdue in being replaced. Speaking to an irrigation contractor recently he indicated a renewal price of roughly 130-140k for a full replacement of the system. The tall roughs received a cut back of a few metres in early May and there has been little regrowth since then. The remaining uncut taller roughs have thinned out as well and the balance seems fair with not too much searching going on. No complaints so it must be ok!! Overseeding – the competition calender eases a bit in the middle of September and it is then that we hope to spike, seed and dress the greens in order to improve the grass cultivar quality. Longer term this improves turf hardiness, appearance and playability with reduced water reliance. Dates are 10 – 12th Sept for this work.